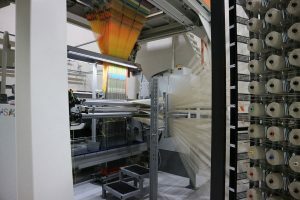 The special double-rapier weaving loom and Vandewiele Jacquard attachment at the Open Hybrid Lightweight Campus (OHLF) in Wolfsburg, Germany. Unique Vandewiele jacquard technology is proving central to research exploring the potential of hybrid woven technical textiles for a leading German research institution. Along with a number of partners, HOFZET® — the Application Center for Wood Fiber Research of the Fraunhofer Institute for Wood Research based in Hannover — has developed new forms of bio-hybrid fibre reinforced composites (bio-HFCs) containing the highest possible bio-based content. “Bio-HFCs are already successfully employed in a range of sporting goods, such as racing cycle frames, tennis rackets and skis, where they have a number of advantageous properties,” explained technical textiles specialist Jana Winkelmann. “In particular, they have a low density, high vibration damping and flexible mechanical characteristics, in addition to the added benefit of containing substantial renewable raw material content. The development work is being carried out on a special double-rapier weaving loom and Vandewiele Jacquard attachment — the only one of its kind in Europe — at the Open Hybrid Lightweight Campus (OHLF) in Wolfsburg, not far from Volkswagen AG’s parent plant. It serves as a competence and research centre for cost-efficient lightweight engineering and innovative materials and manufacturing technologies developed by Volkswagen and its industrial and institutional partners. The OHLF weaving technology is enabling the Fraunhofer experts to cost-effectively produce materials with complex, application-specific textile structures and integrated functions, in widths of up to 50 centimeters. “We are producing load path-appropriate combinations of the different reinforcing fibres and additional matrix fibers to produce hybrid textiles which will provide simpler handling and faster processing, as well as flexibility in achieving the desired mechanical properties in the finished product,” said Winkelmann. Samples of the HOFZET® multi-layer fabrics constructed from new combinations of natural and high-performance fibers. At present, a key HOFZET research focus is on composite reinforcements with a thermoplastic matrix, or organosheets, which offer reversible deformation and recycling potential in comparison with thermoset composite materials. The weaving loom enables the integration of thermoplastic matrix fibers into hybrid textiles as perfect thermoplastic prepregs. These prepregs can be shaped to a required form and turned into composites using hot pressing technology. This approach enables a reduction of process steps, cycle times and production waste. Furthermore, the process allows new design freedom, which enlarges the component spectrum of fiber-reinforced composites. The shaping, for example, can be carried out simply and quickly through thermoforming in a die or in the clamping unit of an injection molding machine. A robot-controlled fiber-spraying unit further expands possibilities, allowing continuous filaments and yarns to be cut to a specific length and simultaneously wetted in an air stream with a mixture of resin and curing agent and sprayed onto a shaping tool. In another project, flax-based multi-layer fabrics produced on the special HOFZET weaving system are being employed to reinforce concrete. 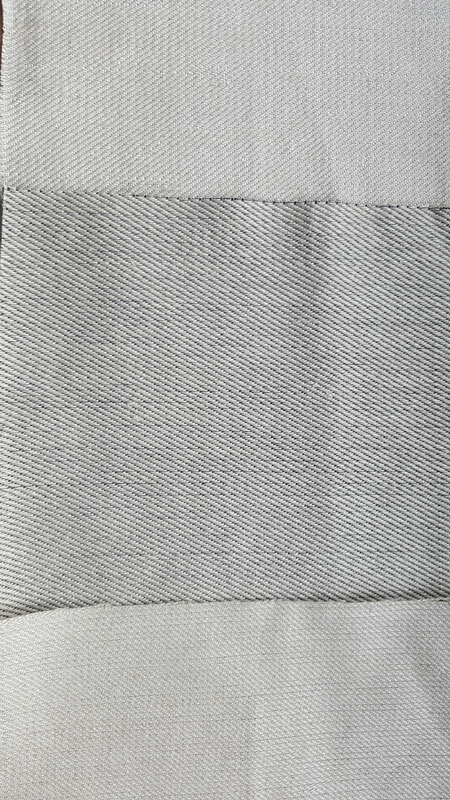 Textile-reinforced concrete has already proved to be durable, formable in diverse shapes and suitable for lightweight construction and so far has been based on carbon or glass fibers to replace the steel which is conventionally employed. 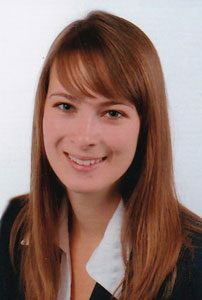 HOFZET® technical textiles specialist Jana Winkelmann. 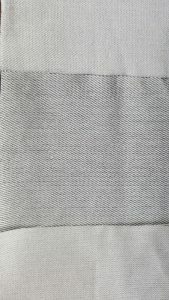 HOFZET next plans to make various modifications to the unique, advanced weaving system, in order to manufacture special spacer fabrics, for which the Vandewiele Jacquard will also play an integral part.